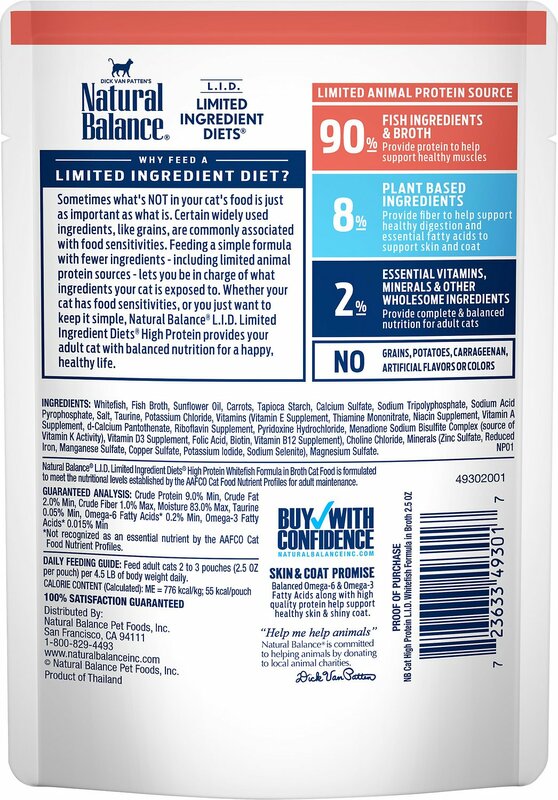 Give your feline friend the complete and balanced nutrition she deserves with Natural Balance L.I.D Limited Ingredient Diets High Protein Wet Food. This delectable wet cat food is designed for adult cats on a limited ingredient diet or just for those who prefer to keep things simple! 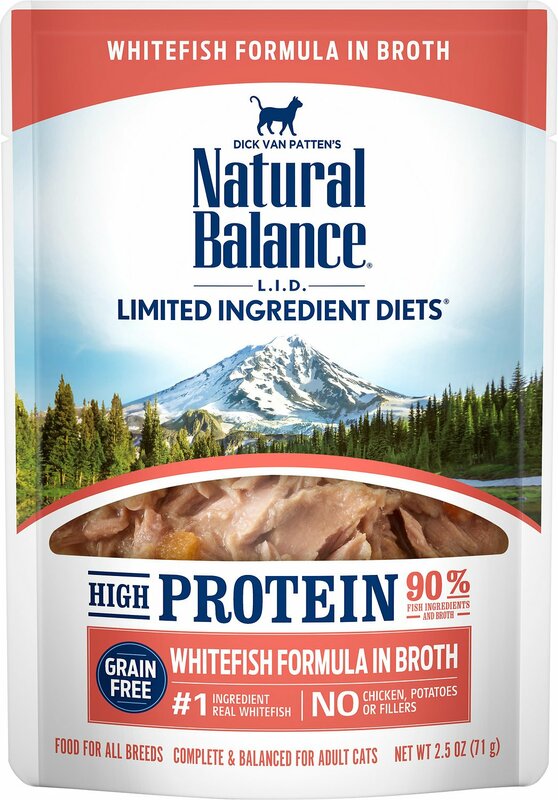 It’s crafted with real whitefish as the only source of animal protein along with real carrots and essential vitamins and minerals all in a savory broth. Plus, it’s free of grains, potatoes, carrageenan, artificial flavors and colors. Just because your kitty is on a limited ingredient diet, doesn’t mean she can’t enjoy the delicious flavors and nutrients that other cats can! High-protein wet cat food contains real whitefish as the first ingredient and the essential vitamins and minerals your cat needs to feel her best. Omega-6 fatty acids help support healthy skin and a lustrous coat, while taurine helps support your cat’s overall health. Grain-free recipe made with zero potatoes, carrageenan, artificial flavors or colors. Designed to provide a balanced diet for adult cats of all breeds. Every order comes with 24 -2.5 oz. pouches, providing your kitty with plenty of meals before you need to restock. When switching your cat’s diet we recommend that it be done gradually over a 5 - 7 day period. Keep clean water available at all times. See your veterinarian regularly. My cat has several allergies. This was a product that contained no pork, chicken, turkey, peas, potatoes, tomatoes, or flax. Max just kept trying to bury this food instead of eating it. OMG they love this product and the Salmon one was their fav. I will be getting more of this for the girls. Non of my 3 cats would touch this. I was very disapointed. Even though the product looked like something they would love. It.